Collecting California at San Jose Museum of Quilts & Textiles in San Jose, California, is showing through February 5, 2012. Collecting California features quilts and textiles from the museum’s permanent collection of works by contemporary California artists. This is the first time the museum has had such an exhibition. 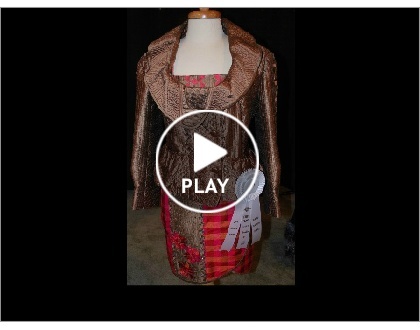 The Quilt Show presented a Smilbox slide show of garments in the 2011 Houston, Texas, International Quilt Festival. in Doylestown, Pennsylvania, through December 31, 2011. Unfolding Stories is at Fenimore Art Museum in Cooperstown, New York, through December 31, 2011. The exhibition will include selections from the museum’s collection addressing themes of diversity, ethnicity, and culture, along with three award-winning quilts from the 2010 New York State of Mind Quilt Show. Fiber Artists Coalition is at Schaumburg Prairie Center for the Arts in Schaumburg, Illinois, from November 1 – November 30, 2011. Two separate exhibitions will be on display. “Some Like It Hot” features work using colors ranging from deep oranges to browns. “13 Ways of Looking at a Blackbird” shows works inspired by the poem of the same name. You are currently viewing the archives for November, 2011 at Woodhaven Studio's Weblog.